Can You Wear Cleats in Indoor Soccer? Mini-trampolines, also known as rebounders, are popular with adults. They’re typically used to improve health and fitness, but children may be drawn to these small trampolines because jumping up and down is just plain fun. Unfortunately, they can be hazardous for children. 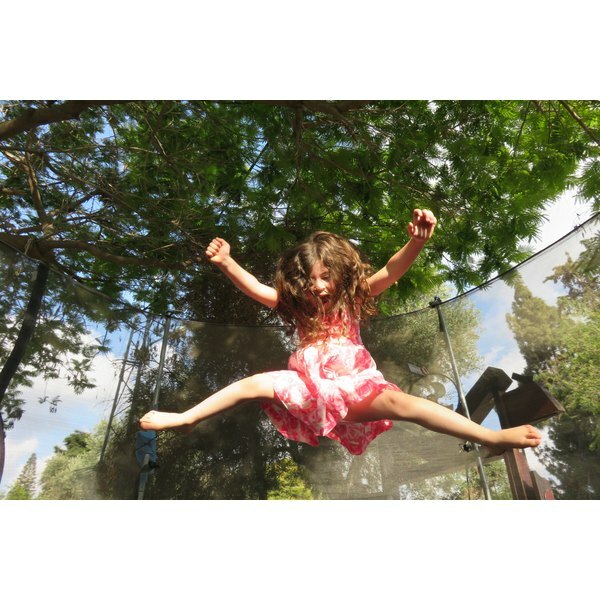 The American Academy of Pediatrics (AAP) states the hazards of trampolines of all sizes outweigh any benefits for children. If you allow your child to bounce on an adult mini-trampoline, it’s crucial to keep safety guidelines in mind. Mini-trampolines are usually around 40 inches in diameter, nowhere near the dimensions of full-size trampolines that typically measure around 40 feet across, according to personal trainer Marji Marshall, a trampoline aerobics instructor at Mountain Fitness Training Center, in Littleton, Colorado. Mini-trampolines are designed to be used indoors. Often they fold up for easy storage in a closet, under a bed or in a corner. The purpose of mini-trampolines is to sweat off calories and improve fitness, Marshall says. Full-size trampolines, on the other hand, are for recreation and intended for use by children. Most trampoline-related injuries occur among children, according to the U.S. Consumer Product Safety Commission (CPSC). Children under 15 comprise over 90 percent of hospital ER injuries due to trampolines, according to the CPSC, and young children under age 5 suffer about 11 percent of these. The AAP indicates trampoline injuries to children include cuts, strains and sprains, broken bones and even spinal injuries. These injuries can occur on large or mini-trampolines, the AAP states. Common causes of trampoline injuries to children include landing wrong when jumping or doing stunts, falling or jumping off the trampoline, landing on the springs or frame of the trampoline and colliding with another person while on the trampoline, according to the CPSC. The AAP recommends that children not be allowed on adult mini-trampolines. The organization says you shouldn’t keep one at home for your children to jump on, and trampolines should never be viewed as play equipment for children. Use of trampolines by children should only be allowed under the supervision of trained recreational supervisors, such as athletic trainers and physical therapists, according to the AAP, which adds that children under age 6 shouldn’t be allowed on a trampoline under any circumstances. The CPSC’s safety guidelines aren’t as strict. The federal agency says kids under age 6 shouldn't use a full-size trampoline and all children using trampolines should be supervised by an adult at all times and not be allowed to attempt somersaults, because landing on the head or neck could cause paralysis. If there’s a chance young children may be jumping on your adult mini-trampoline, be sure to buy a high-quality one. Discount rebounders tend to have a smaller diameter and use shorter springs, making for a harder, less flexible trampoline surface and a higher risk of injuries, Marshall says. Look for one with a balance bar attachment, which is added to the design to help an adult keep his balance while exercising on a rebounder. It can increase the safety for small children who hold onto the bar attachment as well. Never allow more than one small child on the mini-trampoline at a time and ban tricks and stunts. If your children want to jump on a trampoline, consider buying a full-size one for your backyard and installing an approved safety net.